IBM and HCL have outlined their plans for the Notes/Domino portfolio that the former offloaded to the latter last year. Since announcing that HCL would take over development of IBM's collaborationware, the two companies have conducted a long listening tour that saw them stage 22 meatspace meetings and four online forums. The results of that consultation, which reached 2,000 people, plus lab work already conducted by IBM and HCL, were recently presented to the faithful. The top line message imparted to users was that IBM and HCL think Notes can rise again: the companies have given themselves the "big hairy audacious goal" of having Notes seen as "… the application platform that business users tap to solve their collaboration intensive business problems - anyone, anywhere." Execs from the companies said the first step towards that goal will be version 10 of the platform, which will land sometime in 2018. Attendees at a webcast were told version 11 has already been planned. 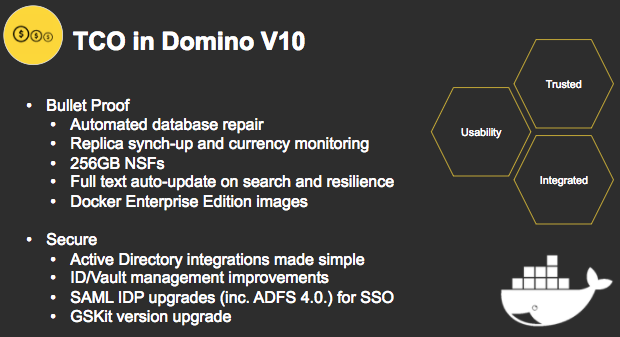 The companies' first moves will be all about catchup: the webcast was told "version 10 is the down payment on the roadmap for Domino 2025" that will "first and foremost deliver a world-class mail experience." Also on the agenda is improving Notes' abilities to work on mobile devices, both for mail and for custom apps, adding a proper team calendar and new chat facilities. Users were also told of plans to "unleash the apps" and "significant progress on apps for the iPad." IBM and HCL's listening tour apparently yielded many requests for improved scalability, so that's on the roadmap too. Restful APIs are also on the agenda, with talk of information flowing to both enterprise apps and SaaS. INM's even decided you might want Notes as a Docker image. All of which sounds like it will bring Notes up to date with modernity, rather than representing a great leap forward. That jump has to wait until version 11 of the platform, which seems set to score all the big buzzwords of 2018: artificial intelligence, machine learning and analytics all scored mentions as being under consideration.